Florida’s two thoroughbred tracks are dark for live racing this Monday and Tuesday. 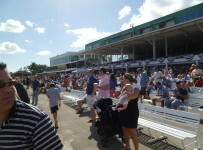 Tampa Bay Downs will have racing on Wednesday with first post of 12:35 p.m. It has no carryovers on Wednesday. It will be dark on Thursday, and then have racing Friday, Saturday and Sunday. There are no stakes races scheduled at Tampa Bay this week. 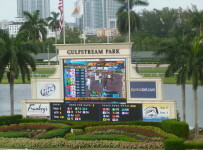 Gulfstream Park will resume racing on Thursday, with ten races and first post of 1:10 p.m. The Rainbow 6 carryover is $377,315 and is on races five through ten. Gulfstream will continue with racing on Friday through Sunday–keeping with its regular spring/summer schedule. Gulfstream has two stakes races scheduled for this week–both on Saturday. The $75,000 Game Face is seven furlongs on dirt for 3-year-old fillies that have never won a stakes race. The $75,000 The Roar is seven furrlongs on dirt for 3-year-old males that have never won a stakes. On each race day morning we will have ;previews with listings of first posts and any carryovers.